Let’s start with the basic question – what exactly is the difference between an idiom and proverb? Are they the same? If you say, “at loggerheads” instead of “strong disagreement among people,” you’re using an idiom. The meaning of an idiom is different from the actual meaning of the words used. “Make hay while the sun shines” is a proverb. Proverbs are old but familiar sayings that usually give advice. A phrase is just a group of words. If you know the meaning of the individual words in a phrase, you know the meaning it conveys. But in an idiom, the meaning is not clear from the words themselves. For e.g. at “raining cats and dogs” is both an idiom and a phrase. “A herd of cats” is a phrase but not an idiom. So let us quickly go through a list of some common idioms and phrases and understand what they mean and how they are used in sentences. Piece of cake – This basically means something that was very easy for you – as easy as eating a piece of cake. For e.g.I thought I was going to fail the test, but it turned out to be a piece of cake! Dressed to kill – What would you think when someone said you had killer looks? A) You look like you murdered someone B) You look great or you’re wearing clothes that are intended to make people notice you. Ok, the answer is B. ‘Dressed to kill’ is what you say when someone does what is described in the ‘B’ option. could also mean overdressing. For e.g. A person doesn’t go on vacation dressed to kill. On the wane – This means something that is reducing or decreasing. For. e.g. The popularity of AAP in Delhi is on the wane. Have you noticed how the moon at any time after full moon decreases in area? This period is called the waning period and now you know why. This is what hitting below the belt means – If a remark is below the belt, it is very insulting and unfair. For e.g. You told them I was the one who ordered the wrong-size carpet. That’s hitting me below the belt. Gift of the gab – A gift is something good to receive. If you have a gift of the gab, it means the ability to speak easily and confidently in a way that makes people want to listen to you and believe you. For e.g. She’s got the gift of the gab – she should work in sales. Face the music – When someone is criticising you, it is not exactly music to the ears, right? If you do something wrong you may have to accept the unpleasant results of one’s actions or in other words face the music. For e.g. After being caught on camera taking a bribe, the minister had to face the music. The party has expelled him and an enquiry has been commissioned. At loggerheads – It means to strongly disagree with someone. If two people or groups are at loggerheads, they disagree strongly about something For e.g. They’re constantly at loggerheads with the farmers’ union. Make hay while the sun shines – Hay is dried grass. To dry grass you keep it under the sun. Would you keep the grass for drying in the afternoon or at night? You do it at afternoon because you want to make the best use of the sunlight when it is the hottest and use it to dry your grass. Or in other words – If you have an opportunity to do something, do it before the opportunity expires. For e.g. While my husband’s out of town, I’m going to watch all the movies he wouldn’t take me to see; after all, you have to make hay while the sun shines. Throw in the towel – In boxing, to signal that a fighter can no longer continue fighting, a towel is thrown into the area where the fight takes place to stop the fight. So if someone wants to signal that they’re going to quit; you could say they are going to throw in the towel. For e.g. The union was forced to throw in the towel and settle their bitter dispute with the company. Throw out the baby with the bath water – You take the baby for a bath and after it’s done throw away the bath water. But do you throw away the baby as well? Silly though, I know. You wouldn’t want to lose something good when you remove the bad. But if you discard something valuable along with something not wanted, you throw out the baby with the bath water. For e.g. You can’t close the airport because one airline has problems – that’s just throwing out the baby with the bath water. Bolt from the blue – Lightning always catches you by surprise, especially if it happens when the sky is cloudless. Similarly, a sudden, shocking surprise or turn of events can be referred to as a bolt from the blue. For e.g. The news that 500 and 1000 rupee notes were not legal tender starting 8th November struck Indians as a bolt from the blue. Spill the beans – You and your parents were planning a surprise birthday party for your sister, but your cousin who got to know this spoiled the fun by letting your sister know – basically your cousin spilled the beans. This idiom is used when you want to convey that someone or something let secret information become known. Weather the storm – When you are faced with a difficult situation and survive, it is like you survived a storm. Or in other words, something continues to exist and not be harmed during a difficult period and stays right despite experiencing serious problems or great difficulties. Thus it weathers the storm. For e.g. If she can just weather the storm of that contract violation, she’ll be fine. Bite your lips – What happens if you bite your lips? It hurts and you don’t talk for some time. If you forcibly prevent oneself from exhibiting an outward reaction to something, especially that which makes one angry, irritated, or upset, you could say you bit your lip. For e.g. I just had to bite my lip while the boss yelled at me for losing the account. So this is the first set of important idioms and phrases. 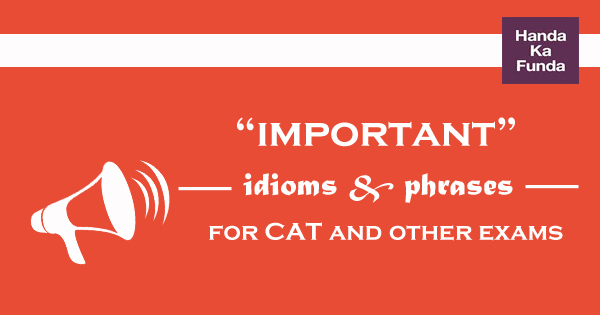 We will continue this list in the next post with more idioms and phrases. If you haven’t read them already, check out Understanding Confusing Words – Part 1 , Understanding Confusing Words – Part 2 and Understanding Confusing Words – Part 3 .